Want to bask in the glory of the gold? This robust self-balancing electric scooter in gold is a delightful joy ride to kickstart your day. Its sensationalizing performance will make the onlookers skip a beat at once. 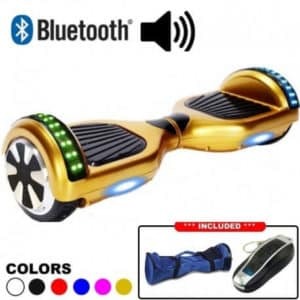 The attractive lustrous golden color gives the self-balancing hoverboard a very classic, shimmery modernized look which will get you noticed from a distance. The sturdy 6.5-inch self-balancing electrical hoverboard scooter will bring out the adventurous persona as you travel at a thrilling fasting speed of 10 kms per hour. The inbuilt advanced hi-speed chipset alarms the user after crossing a speed of 12 kms per hour. The self-balancing wonder has the potential to cover up to 15-20 kms travel distance; which will make you feel like the swaying on waves in the ocean. The Australian engineering miracle works on a reliable Samsung Li-ion battery which can be easily charged even at your workstation. The physical attributes for the basic functioning of the hoverboard are based on the concept of state-of-the-art responsive acceleration in association with too and fro motions like that of a pendulum. The bright electric blue color LED lights in cohesion make night travelling safe and attractive. The twirling wheels are designed to make their way thoroughly and leisurely, even through resilient pathways. The spectacular sensation comes with an accessory kit inclusive of a Bluetooth and a trendy carry bag which will make its handling much easier. Even a kid or a senior citizen can drive this mini beauty at ease and make short trips to a supermarket or long routes to your college; enjoying nature closely and avoiding the hustle bustle of today’s life. You will receive your items in 3 to 5 business days after your order dispatched.